We finally find out what’s keeping those Farmies loyal and continually coming back for more. Well, kind of. Not so much the how but the what. It starts when the Farm hosts an open house for people to come and get to know the Farm and see what it’s all about. Betty has a brief run-in with her mother while taking the tour and it’s very clear that Alice feels Betty abandoned her, so it’s a relationship not worth putting effort into. Our ever-determined Betty tries to find a way in by sitting for an interview but Evelyn isn’t taking the bait. Betty decides to play the family card and recruits Cheryl into helping her sniff out what’s going on inside that place. Cheryl somewhat begrudgingly agrees and sits for an interview with the not-so-hard-on-the-eyes Edgar Evernever. Cheryl manages to get through the first interview without raising too much suspicion but isn’t quite so lucky the second time around. 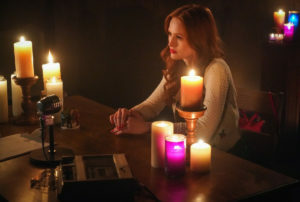 Now, you’d think this would lead her to be asked to leave but all we know is what we hear on the recording device Cheryl is wearing: Edgar wants to show her something and then we hear nothing. Betty suspects part of what’s holding people to the Farm is the confessional tapes they make with Edgar which she subsequently breaks in and steals during another open house situation. However, when Betty shows Cheryl she has the taped confession and Cheryl doesn’t have to keep going back, Cheryl says she wants to keep going back because she can see JJ who happens to be her dead brother. Perplexed, Betty has a sit down with her mom at Pop’s and asks if she’s so beholden to the Farm because she can see Charlie, the son she had with FP whom she gave up. We see Alice soften and turn into this whole other person talking about how much Betty would like her brother if she got to know him and so on. But Charlie is also dead, so how is this magic happening? That we don’t know yet but Betty finally got her sit down with Edgar Evernever and I suspect we might have some answers soon. The Serpents are in training with Tom Keller and FP Jones in preparation for their new lives of upholding the law but they aren’t so great at stealth entry at the moment. In fact, they aren’t really fit for fieldwork because there’s a good chance they could get themselves killed from not paying attention to their surroundings. This isn’t stopping them from going against orders to sniff out all the Fizzle Rocks dealers that are operating in Riverdale. The problem is these guys aren’t at the old haunts anymore: they are doing it the old fashioned way, on the street. Gradually, the Serpents manage to take down dealers but fail to tell the sheriff when one takedown leads to an undercover operative buying Fizzle Rocks for FP: a bust that would’ve led FP to the cook, but the Serpents totally ruined it. Back at home, Gladys is trying to play the “concerned mother” after Jughead gets busted but it’s really just a ruse to keep him home and keep her candy business going. Jughead isn’t really one to listen, especially when it comes to keeping drugs out of Riverdale and, thanks to a tip, he knows where to suss out the Fizzle Rocks cook. Jughead and the Serpents team up with Archie and some of his prison friends to infiltrate their drug den (it’s crawling with Gargoyles) and catch the cook, the always-irritating Kurtz. They manage to get in fairly unscathed and Jughead does capture Kurtz but he pulls a fast one while they are on their way out and says, “I’m ready to ascend. Are you?” and proceeds to punch himself and Jughead out a boarded-up window a few floors up. The two have a hard landing but survive the fall and Kurtz manages to escape. Jughead confronts mommy dearest back at home and her basic response is, “Keep your nose out of my business and you won’t have to dodge bullets.” Compassionate, isn’t she? The news of Veronica’s parents splitting isn’t sitting too well with Veronica and, while she’s not trying to “Parent Trap” them, she’s still scheming a bit. Hermione is worried that her divorce from Hiram means she will lose the protection that comes with his name and other mob families will come after her. This fear is heightened when she receives dead fish in the mail as a warning. Veronica convinces Hiram to publically appear with Hermione at the opening of his prison, something that wasn’t originally on the agenda. 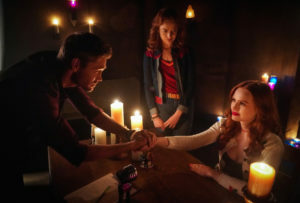 However, after the very public event where Hiram verbally stated his love for his wife and daughter, Veronica learns that Hiram has opted for an annulment, which will still provide Hermione with the protection of his name even if they are no longer together. And as an addendum, Hiram calls out Veronica for sending her mother the dead fish to scare her. She plays dumb at first only to admit that she hoped that being around each other would re-ignite something for them. At least this way she doesn’t have to worry quite so much about her mother’s safety. Archie got a call from Mad Dog – you remember him, right? He’s the guy who helped Archie getaway during his big escape. According to Mad Dog, everyone is moving to Hiram’s new prison as they are shutting down L&L. Apparently, there’s a juvenile’s wing at the new prison and all the old guards who made the kids fight are making the move, too. If that wasn’t enough, the parole hearings for Mad Dog and others have been canceled for no reason and the assumption is they want bodies in cells for the new place. This leads Archie to ask Veronica for a favor and through some trickery and mild blackmail, the two get Governor Dooley to pardon the boys and release them. Since they really have nowhere to go, Archie sets them up at his gym. It might not be home but it’s a place to sleep. But by the end of the episode, Mad Dog is leaving to take Elio up on his offer and Baby Teeth is dead in the woods with blue lips and carvings in his skin.